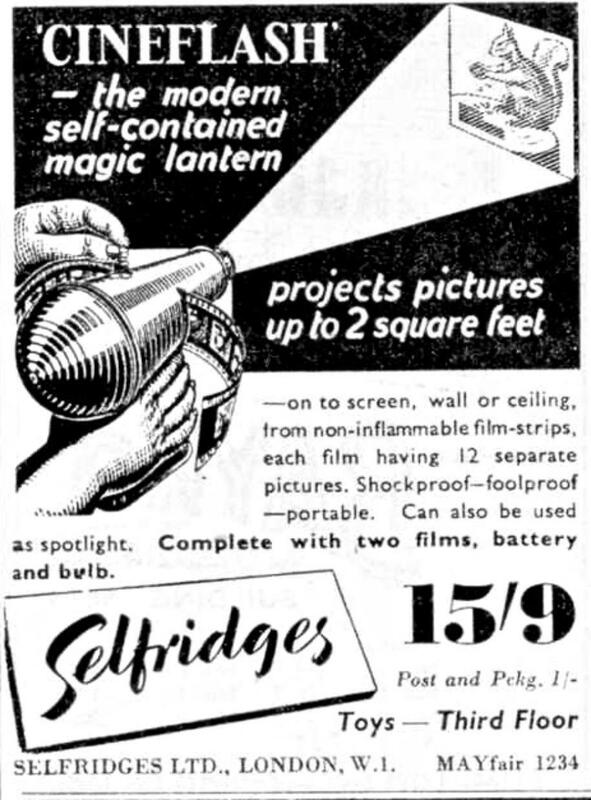 Cineflash Filmstrip Projector.Advertised in English Comics circa 1948.Made by CINEFLASH Ltd,44 Fulham Road,London,SW3. Handle contains a 4.5volt battery. The beginning of my love affair with film and projectors! In 1949 a half-a -crown got me a German BING projector that showed 35mm film.I purchased it from a fellow third-former who was only interested in football. With it came,a reel of film about elephants.I insisted on trying to show a five foot wide picture-and the resultant image was decidedly dim.Press-ganged audiences,unable to decipher the flickering images on the screen, invented a guessing game.Every now and then an inspired soul would exclaim,"It's an elephant!" ,and be declared,"the winner". I'd pester the projectionist at the Crystal Palace Theatre,for film cuttings.Once he gave me a bit of a "Mighty Mouse" cartoon.That was a great day. Eventually,an adult offered me a pound for the BING.I've always had a weakness for money,so I took the offer-and found myself projectorless. Whilst mourning my "loss' I noticed a RADIO & HOBBIES magazine advert for a strange looking little device called a DUX CINE. I pondered the picture of this item,wondering how on earth film fed in and out of it. Eventually I discovered it used a special film.One where two rows of images,illustrating two extremes of movement,were arranged horizontally and one above the other,on a strip of 35mm film. Said film would traverse the DUX projector's gate where an upper and lower lamp would alternatively project a top then bottom image-so the end result was a projected picture giving the illusion of movement. Very clever,I thought.I must have one of these. A couple of months on,my DUX Cine,bought by mail-order then held in our pretty strict CUSTOMS DEPT(of 1950),arrived.I had to go down to the main Post Office in Queen St. Auckland,to pick it up. Total cost was just over three quid. Once conversant with the wee machine's clockwork motor and film-feed system,I demonstrated the DUX CINE to a cousin who had ideas about becoming a projectionist. "I thought you had a REAL projector",he sneered. Well and truly put down,I shelved the little DUX. I wasn't despondent for long though,I had a "Plan B". In upper Queen Street,Auckland, there was an nifty outfit called SLY's LTD. They dealt in footwear and photographic gear.They were,in fact,the New Zealand agents for PATHESCOPE of England,the well known makers of 9.5mm cine equipment. For some weeks I'd been admiring a PATHESCOPE "ACE" projector sitting in the display window of this shop. It seemed to have all the features a young film buff could want. I really lusted after this machine,I HAD to own one. I told my parents of my aspirations.Mum said,"quite right dear" but my father,very unreasonably,said I couldn't have an ACE until I'd learnt Theorem 8 and turned sixteen.Bugger! I waited and waited,and on my 16th birthday I got off down to SLY's where my trembling hands took possession of a brand new PATHESCOPE "ACE" and a 60ft film about Spitfires. After which came a host of 8mm and super 8mm machines!